Brian received his Rolfing certification from The European Rolfing Association in Munich, Germany. His journey to Rolfing and a well-balanced body began years ago. For a time Brian experienced periods of ill health and physical limitations. During this time he was also passionate about sports and the sense of freedom and expression he experienced through movement. Learning to balance and find ways to overcome limitations lead him to Rolfing. It is through Rolfing that he hopes to help others live healthfully and happily in their bodies. Brian is constantly enhancing and expanding his knowledge of Rolfing, movement, and the body in general. As of recently you can also find him as an Assistant Teacher for Advanced Trainings- a bodywork school that conducts classes in Myofascial techniques. 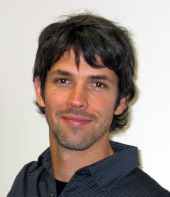 Prior to Rolfing, Brian graduated from The Evergreen State College in Olympia, WA. His focus while attending TESC was in Sustainability, Food Systems, and Local and International Communities. After graduating from TESC he taught English to adults in Olympia, and then in Chicago for a number of years. He found this work extremely rewarding. Brian has recently relocated to Portland and is excited about exploring this new city and the natural beauty that surrounds it.